Preheat oven to 425°F. Place a large baking sheet covered in foil on the lowest rack in the oven. This cobbler overflows a bit almost every time I make it. The baking pan will catch the drips and prevent a mess in the oven. In a large bowl, combine the peaches and the lemon juice and then add the rest of the filling ingredients. Stir to coat and then pour into a 9x13 baking dish. Bake the peach mixture in the preheated oven for 10 minutes. While the peaches are baking, combine the dry topping ingredients and whisk to combine. Toss the grated butter in the flour mixture. Stir in the boiling water, just until combined, leaving plenty of little lumps of butter. Remove the peaches from the oven and drop the topping over them in spoonfuls. (I like to use my smallest cookie scoop to do this.) Sprinkle the cobbler topping with the cinnamon sugar topping. Bake until the crust is golden and a toothpick inserted into the crust comes out clean, about 28 minutes. Serve warm or at room temperature. Enjoy! FREEZER DIRECTIONS: The peach filling can be prepared and frozen in advance. I have frozen it for up to a year without any problems. Combine the peach filling ingredients in a large ziploc bag, press the air out and freeze flat. When you are ready to bake the cobbler, thaw in the refrigerator and then pour into the baking dish and proceed with the recipe. Using a cheese-grater to "grate" cold butter is my favorite hassle free wait to cut in the butter. It takes just a moment and I think it's simpler than the more traditional methods. If you choose not to use the grater, simply cut the cold butter into small pieces and then blend it into the flour mixture, using a pastry blender or your fingertips. It is entirely up to you whether or not you choose to peel the peaches for this cobbler. 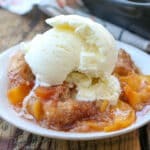 For years, I took the time to peel the peaches and loved the recipe like mad. About a year ago, I stopped peeling the peaches and I've never looked back. I can hardly tell a difference and I doubt I'll ever again peel the peaches for a dessert.